Wow your guests and make these Juicy Melt-in-Your-Mouth Instant Pot Short Ribs! You won’t want to miss out on this Tender Red Wine Braised Beef Short Ribs, soaked with rich sweet-savory-umami beefy sauce. Paired with buttery mashed potatoes cooked in the same pot. Yum! No need to turn on your oven or slow cook the short ribs for hours to achieve this rich beefy melt-in-your-mouth heaven-on-earth. 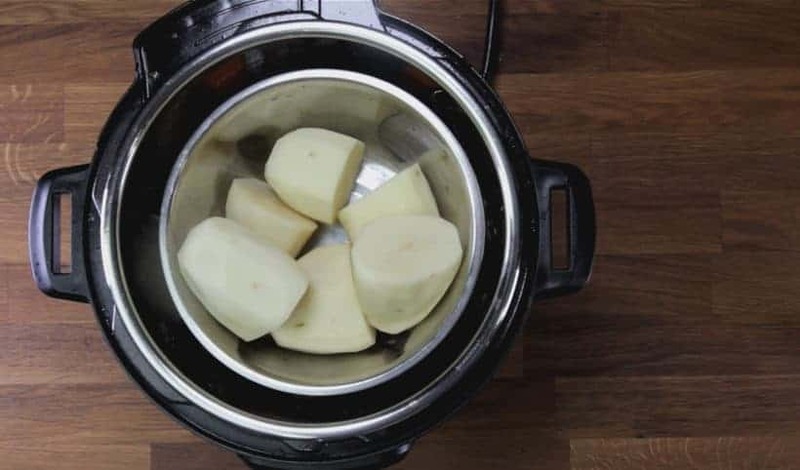 Plus, you can save time by cooking potatoes at the same time right in the same pot. How awesome is that?! Eataly, Chelsea Market, Brooklyn Pizza, legendary chocolate chip cookie…Oh man~ We loved every minute of our New York Foodie Trip! Make these Juicy Melt-in-Your-Mouth Instant Pot Short Ribs that will impress your guests! 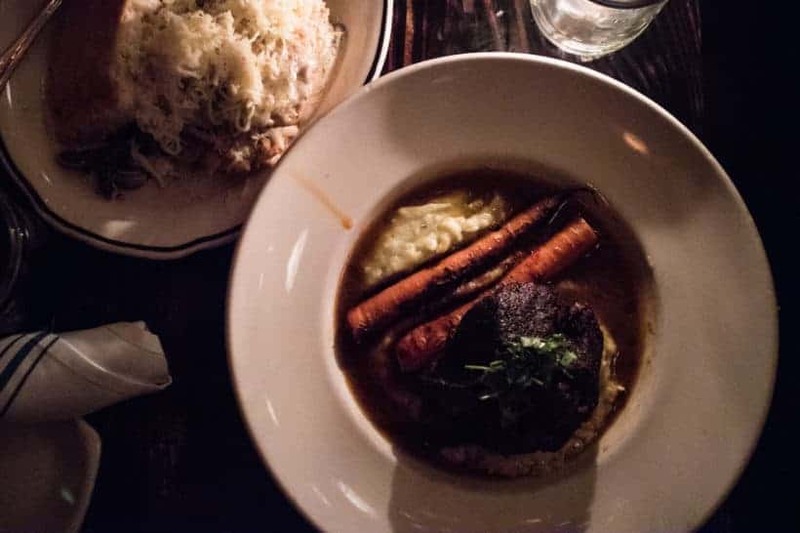 Fall-Off-the-Bone Tender Red Wine Braised Beef Short Ribs, soaked with deliciously sweet-savory-umami flavors. Paired with buttery mashed potatoes cooked in the same pot. 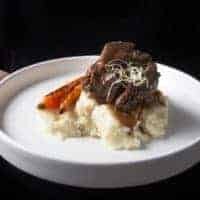 Brown Short Ribs in Instant Pot: Heat up Instant Pot using Sauté More. Wait until it says HOT (prevents short ribs from sticking to the pot). Add 1 tbsp (15ml) olive oil in Instant Pot. Season one side generously with salt and black pepper. Add in 5 pieces of short ribs, then brown each side for 4 minutes. While one side is browning, season the other side with more salt and black pepper. *Pro Tip: Avoid overcrowding by browning short ribs in batches. Saute Onion & Garlic: Set aside the browned short ribs. Add in sliced onions, and saute until soften (~ 3 minutes). Add in chopped garlic, and saute until fragrant (~30 seconds). Saute Veggies & Spices: Add in chopped carrots, celery, a pinch of dried thyme, and 2 bay leaves, then saute for 2 minutes. 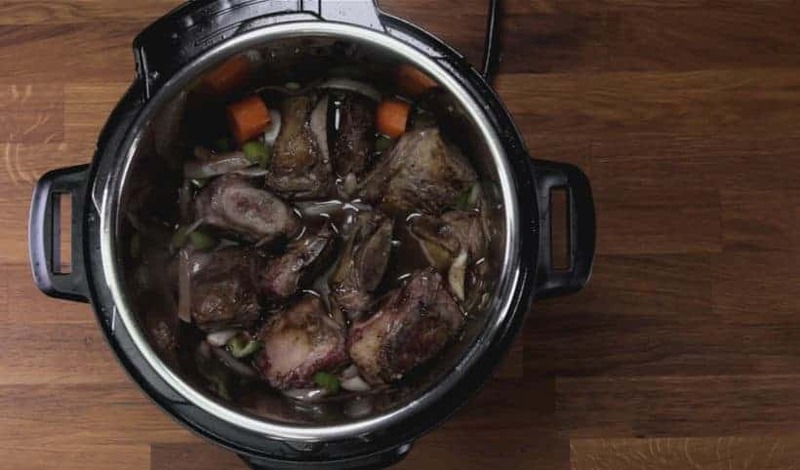 Deglaze Instant Pot: Pour ½ cup (125ml) red wine in Instant Pot and deglaze by scrubbing the flavorful brown bits off the bottom of the pot with a wooden spoon. Give it a quick mix. Let the wine simmer for a minute to allow some of the alcohol to evaporate. 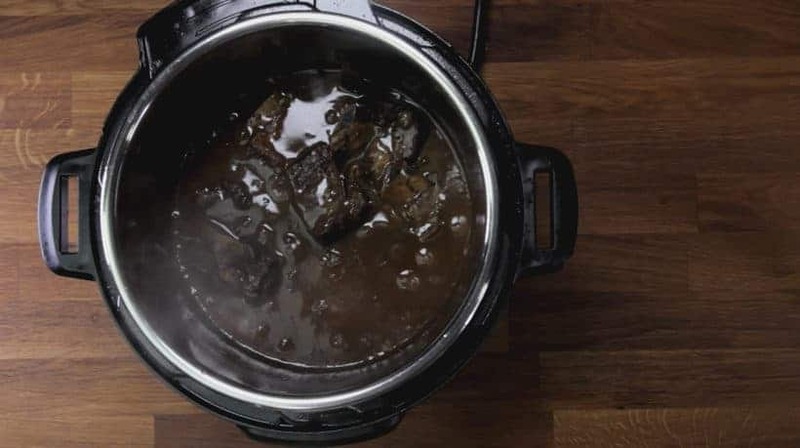 Pressure Cook Short Ribs: Add 1 tbsp (15ml) light soy sauce, 1 tbsp (15ml) fish sauce, 1-1.5 tbsp (14-21g) brown sugar, 2 tbsp (30ml) balsamic vinegar, and ½ cup (125ml) unsalted chicken stock in Instant Pot. Carefully add in browned short ribs + meat juice.If you are making mashed potatoes: Cut 3 - 4 potatoes in half, then place them in a stainless steel bowl. Layer the bowl on top of the short ribs. 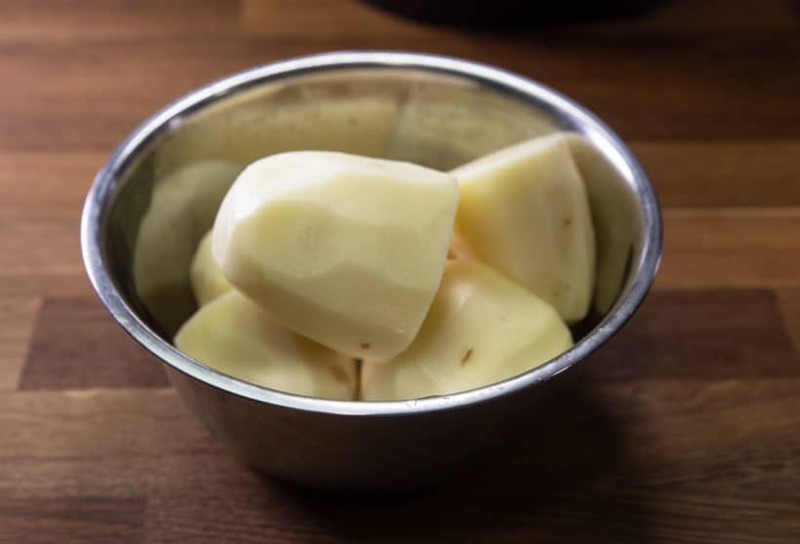 Optional - Make Mashed Potatoes: Drain & transfer the potatoes to a larger mixing bowl. Mash the potatoes with a potato masher. Mix in 100ml whole milk and 1 – 2 tbsp (14g -28g) unsalted butter. Season to taste with salt & pepper. Thicken & Seasonings: Carefully set aside the short ribs. Mix 2.5 tbsp (22.5g) cornstarch and 3 tbsp (45ml) cold water together in a small mixing bowl. Bring the sauce to a simmer and add the cornstarch mixture one third at a time to thicken the red wine sauce until desired thickness. Taste and season with more salt, black pepper, and brown sugar if necessary (For reference: we added 3 large pinches of salt). Serve Short Ribs: Carefully place the short ribs back in the sauce to keep them hot. Serve & be prepared for your guests to beg for more of this deliciously beautiful creation! Brown Sugar: be sure to adjust the sweetness level to your taste. Use 1 tbsp (14g) brown sugar for less sweet; 1.5 tbsp (21g) brown sugar if you enjoy a sweeter sauce. 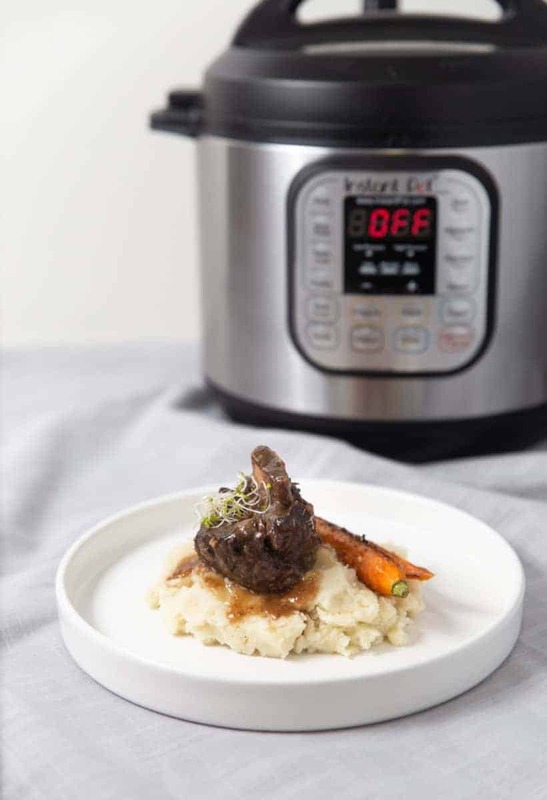 We conducted multiple tests with Short Ribs using different amounts of cooking time in our Instant Pot Electric Pressure Cooker. Conclusion: Test #3 yields the most satisfying combination of fall-off-the-bone tender, yet juicy & moist, plus rich & buttery beefy flavors. 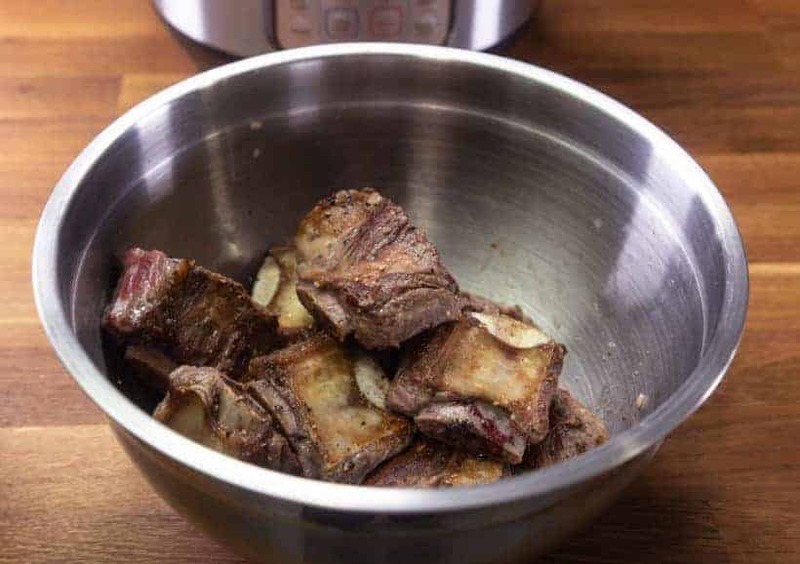 Prepare Ingredients for Instant Pot Short Ribs. 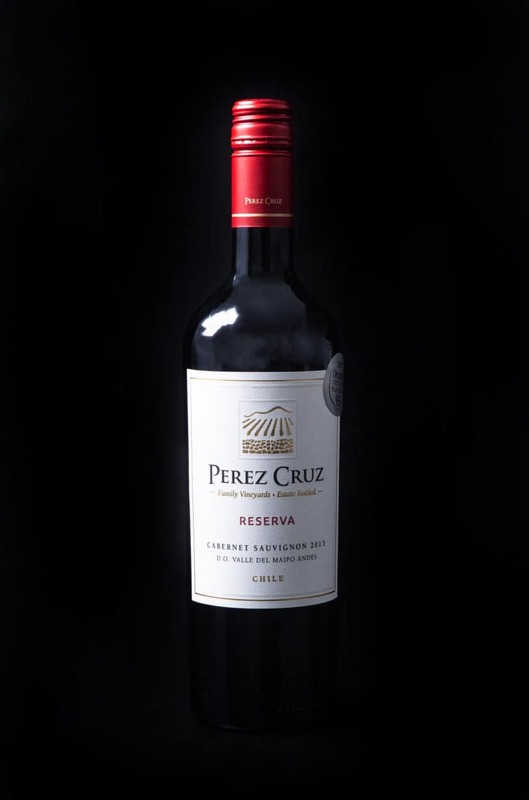 We chose this Perez Cruz Reserva Cabernet Sauvignon from Chile for our recipe. Wait until it says HOT (takes roughly 8 minutes). This prevents the short ribs from sticking to the pot. Add 1 tbsp (15ml) olive oil in Instant Pot. Season one side generously with salt and black pepper. Add in 5 pieces of short ribs and brown each side for 4 minutes. While one side is browning, season the other side with more salt and black pepper. *Pro Tip: Do this in two separate batches to avoid overcrowding. Set aside the browned short ribs. Add in sliced onions, and saute until soften (~ 3 minutes). Add in the chopped garlic and saute until fragrant (~30 seconds). Add in the chopped carrots, celery, a pinch of dried thyme, and 2 bay leaves. Saute for another 2 minutes. 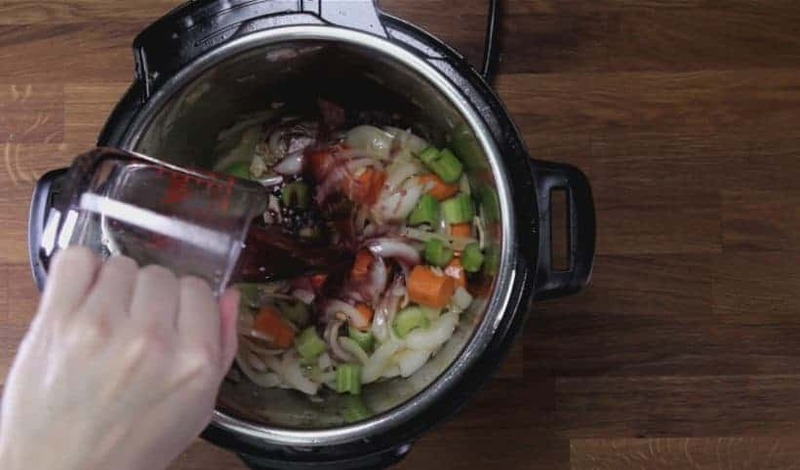 Pour ½ cup (125ml) red wine in Instant Pot and deglaze by scrubbing all the flavorful brown bits off the bottom of the pot with a wooden spoon. Give it a quick mix. Let the wine simmer for a minute to allow some of the alcohol to evaporate. Add 1 tbsp (15ml) light soy sauce, 1 tbsp (15ml) fish sauce, 1 – 1.5 tbsp (14 – 21g) brown sugar, 2 tbsp (30ml) balsamic vinegar, and ½ cup (125ml) unsalted chicken stock in Instant Pot. *Pro Tip: adjust your sweetness level accordingly. If you like a less sweet sauce, use 1 tbsp (14g) brown sugar; if you enjoy a sweeter sauce, use 1.5 tbsp (21g) brown sugar. 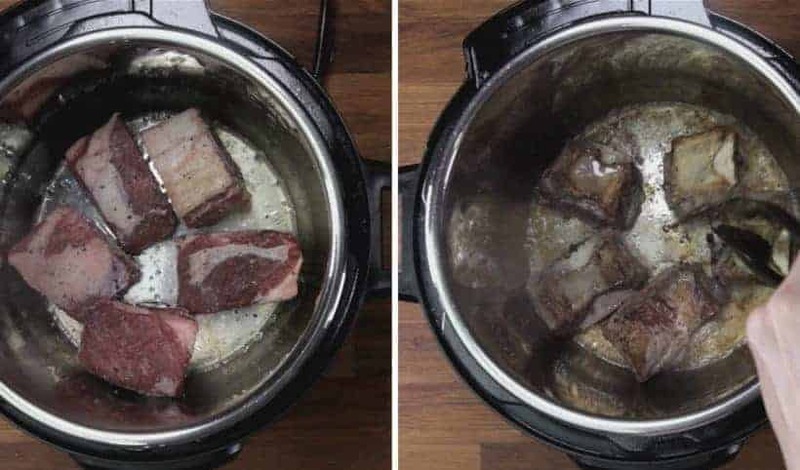 Carefully add browned short ribs in Instant Pot. Make sure to add in all the juice! 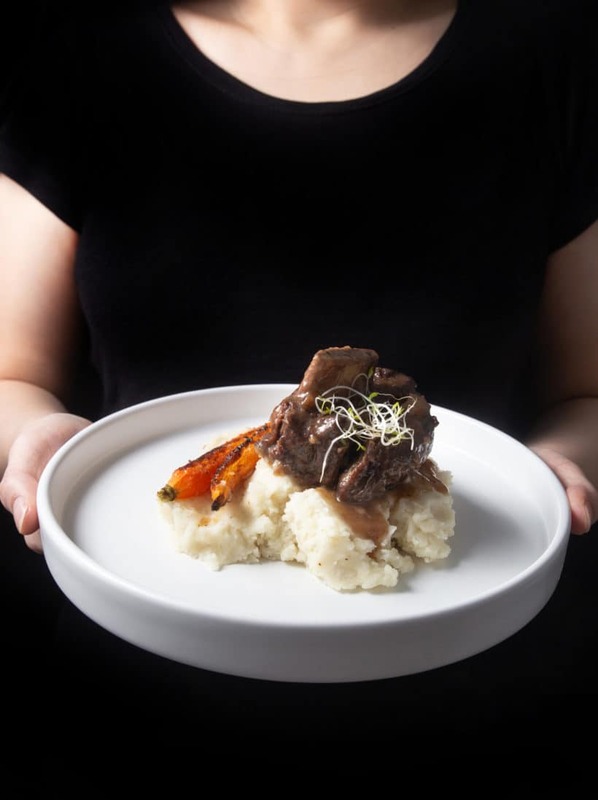 If you want to make mashed potatoes with the short ribs: Cut 3 – 4 potatoes in half and place them in a stainless steel bowl. Then, layer the bowl on top of the short ribs (as shown in below photo). With Venting Knob in Venting Position, close the lid and turn Venting Knob to Sealing Position. 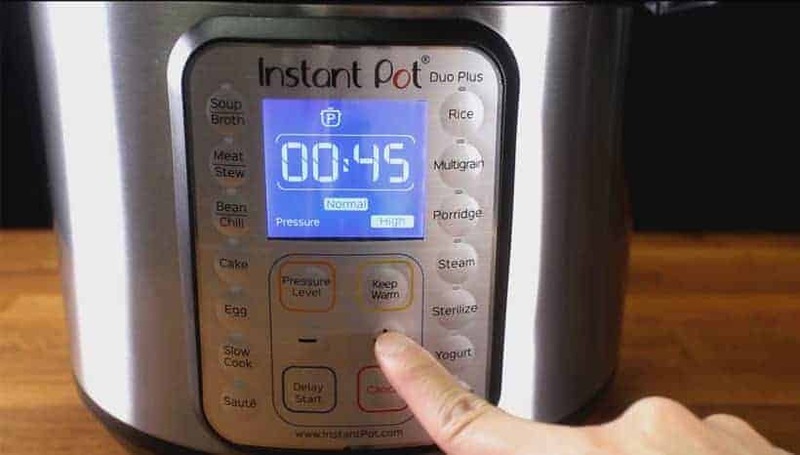 After 15 minutes, release remaining pressure by turning Venting Knob to Venting Position. When Floating Valve drops, open the lid carefully. *Pro Tip: It may be a good idea to drain & transfer the potatoes to a larger mixing bowl. 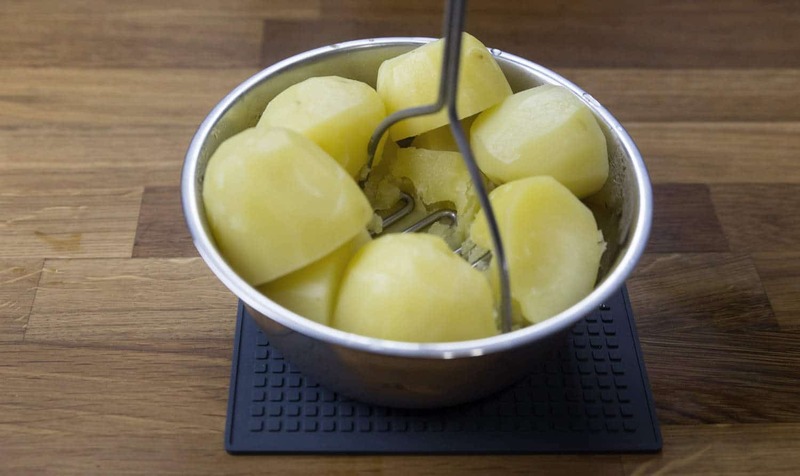 Mash the pressure cooked potatoes with a potato masher. Mix in 100ml whole milk and 1 – 2 tbsp (14g -28g) unsalted butter. The Instant Pot Short Ribs will be fall-off-the-bone tender, so carefully set aside the short ribs. Bring the sauce to a simmer and add the cornstarch mixture one third at a time to thicken the red wine sauce until desired thickness. Taste and season with more salt, black pepper, and brown sugar if necessary. For reference, we added 3 large pinches of salt. Carefully place the short ribs back in the sauce to keep them hot. *Pro Tip: The short ribs will taste even better after sitting in the sauce for 10 – 15 minutes. Thank you for sharing these delicious recipes. They are wonderful and easy to prepare. I’ve made at least 10 dishes from your recipes. All great for parties or meal for two. Please keep feeding us new ideas. We’ll for sure work hard to create more delicious recipes! Stay in touch! I have made and enjoyed quite a few of your IP recipes! I use boneless ribs because they fit in my mini IP and they come out tender and delicious! A small bowl with potatoes fit in my mini, too. I finally got fish sauce as I see that you have other recipes it can be used in. Happy to hear you enjoyed the short ribs and how it turned out in the mini! One word……… A..MA……ZING!!!!!!!!! Huge hit with the family and a definite make again recipe. Everything about it was perfect. Put knives on the table, no one needed them, the meat fell apart. Flavour was incredible. Have never been so pleased with a recipe. Can’t wait to make this again. Meat fall off the bone and very flavorful! Thank you for the recipe. Wow. That may have been the most delicious meal I ever produced in my pressure cooker! I used the Costco prime boneless ribs. We don’t eat sugar, so I used a bit of brown sugar Swerve instead of real sugar. Thanks for this amazing recipe! Great recipe! Worked great with the prime boneless short ribs available at Costco. I was too lazy to go to the store to get celery, so subbed mushrooms, and deglazed immediately after the meat by accident, but it still came out amazing. Will definitely make with a carb or carb sub next time. Had the left over gravy the next night with riced cauliflower and broccoli….so good. Mushrooms are great choice as well! Seared the ribs on the grill first. Then put them in the Instant Pot. Wow, I’m not a short rib fan but wow did this change me!!! I agree with the others that this is restaurant quality for sure. I put it on Cauliflower mash and it was soo good. The only thing I did was added a little Kitchen Bouqeut at the very end! My husband who is very picky loved it and said it was a keeper!!! This was absolutely delicious! The only thing i didn’t have was fish sauce, and didn’t miss it. I made potatoes separately because my pot was pretty full with 10 ribs. I would add a few more carrots next time, and keep them longer pieces..
Well….there are no words for just how good this is. I will just say I thought my husband was going to lick his plate and my dog was whining at me from under the table. THAT’S how good it is. I used beef consume because I wanted a really rich sauce, and I definitely got it! Your story made our day hehe!! I made this tonight and it was a hit with my family!!! I added mushrooms, but everything else was the same. 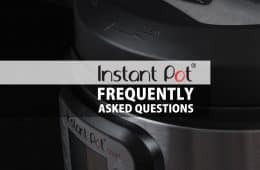 Your website is my go to for Instant Pot recipes. Thank you! When do you add the mushrooms? Prior to closing the lid and pressure cooking? I figured that doing so would totally destroy the mushrooms… Perhaps add them after when the sauce is being simmered/thickened with the cornstarch slurry? You can saute the all mushrooms. Keep half into pressure cook for flavor and set aside the other half to place them in at the end. We just LOVE your recipes. I really want to try this. However, we are currently on a ketogenic diet. Is there a low carb substitution for the brown sugar that we can use? Thanks again for all your wonderful recipes. I use your IP pot roast recipe frequently. You can skip the brown sugar for this recipe. Simply amazing flavor and texture. This was the first IP recipe I’ve made that my wife said after her first bite “OMG this is really good”. I doubled the recipe using an eight court pot with 4lbs of boneless short ribs and cooked them for 45 minutes. The only thing I changed was that I substituted a bunch of fresh rosemary, thyme and oregano for the onions, carrots and celery. Superb! I have used many short rib recipes, but this by far, is my FAVORITE! The taste and tenderness of the meat, is the best I have ever had! These are better than any restaurant ones, I have ever had. What a merger of savory flavors. I think I will modify this same recipe slightly, and try it with some pork. The gravy is so good, you hate to throw any away, once the meat is gone. Your comment made our days! The best rib and potato recipe I’ve had! Amazing! AMAZING!!! But this has been my (our) response to any of your fabulous recipes! Made it last week and am making it again tonight because we enjoyed it so much. Tweaked it a bit by adding three tablespoons of tomato paste and a cup of mushrooms. Delicious! Thank you Amy and Jacky for another amazing recipe! These were a big hit!!! The amount of time you recommended was on point!!!! They were fall off the bone delicious!!! Highly recommend this recipe!!!! This is one of those dishes that is so good that it doesn’t warrant tinkering with but is tolerant of additions. I have made it several times. And shared it with family members. I have added half a cup of fermented pimentos on occasion and fennel on another. They both bring a different flavour profile; not obviously better, just interestingly different. One thing does improve it imoh. Letting it stand somewhere cold overnight in a fridge or a screened in verandah in northern latitudes in winter. Short ribs usually are quite fatty. The rendered fat which floats on the surface of the hot gravy congeals and is easy to lift off. Don’t worry about leaving a little behind. It adds to the richness of the mouthfeel. It’s easier to remove the fat if you take out the meat before you chill the pot. The magic is the additional depth and complexity of flavour you get by leaving it stand for a day. The same thing goes for many stews and casseroles. They are invariably better the next day. Thanks for your great work on this blog. 2nd time using my instapot and this came out fantastic! I see why someone said they wanted to lick the bowl. If you are unsure of your ability with the instapot, and finding a dish you’d like, I’d tell you Go for this one! I’ve never cooked or eaten short ribs before, and I loved them! My husband didn’t want potatoes, so I used one of the microwave rice pouches we had. Soo good! I used baby carrots because I had lots of them left from a party, and I used Apothic Red for the wine…again left from the party. Thank you again! I’m feeling more confident with my instapot now. Made this tonight – it was AMAZING! Turned out perfectly, thank you for the concise instructions. I loaded up on Pepper, and added a bit of zip with some cayenne, it added a little heat without taking away from this delicious meal. This is my first time on your site and i’ll Be back thanks so much!! Is the cook time the same for boneless short ribs? This looks delicious! Boneless short ribs will take a few minute less. Mouthwatering delicious…this is a keeper recipe. I did not deviate from the recipe, it is perfect as written! So happy to hear from you again. Thank you so much once again for this super kind comment and rating!! Do I cook for less time for 2 lbs ribs. Thank you for your question. The cooking time will stay the same. This is the best Spareribs I’ve ever had ! I’m not able to follow any recipe to the letter. I used this as a start, and is was amazing. Definitely try it out. Delicious! I added 1 red bell pepper, 1 jalapeno, 16 ounces of sliced mushrooms and about 2 cups of fresh pineapple chunks. I love the pineapple! I served it over rice. I only have boneless short ribs, can I still follow this recipe accordingly or are there modifications / different recipe for boneless short ribs? Thanks and as always, love all your recipes! I recommend shortening the cooking time by roughly 3 minutes. Amazing levels of flavor! Was a great hit with the family. Delious gravy. Time cook worked well for boneless county beef ribs, if you like the meat to easily fall apart (which I like). Young grandson ate 2 helpings. Served with egg noodles. The ribs were so flavourful and delicious and falling off the bone. The meat melted in my mouth; I have to say the best beef short ribs I’ve ever tasted. Will definitely make again. Just made this. so good!! 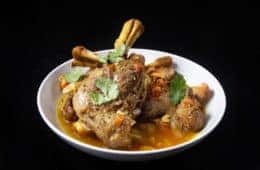 I replaced beef short ribs with just regular ribs to save money, and some lean meat for my husband (he doesn’t like fat, he’s weird)… thanks for sharing this recipe!!! Happy to hear how well regular ribs turn out. Can stove top pressure cooker be used for this recipe ? thx. Thank you for your question. This recipe will work fine on a stovetop pressure cooker. You will want to reduce the cooking time by 15%. These came out perfect. This recipe is easy and thorough. I appreciate the information about how long to cook. I’m making them for the second time in two weeks tonight. Hi! What can I substitute with red wine? Can I use Sake or Rice Wiine? Thank you for your question. Sake or rice wine will not work that well. You can use dry white wine. I wanted to make a special birthday dinner for my wonderful son-in-law. One of his favorites is short ribs. I went to a local butcher shop and got the meat. They came out awesomely. He said, “Five stars!” And he even remarked at how much extra flavor the potatoes had after cooking in the pot. That was my first time trying pot in pot cooking. One important note: I did not use wine, only chicken stock. Still delicious. Thx for your work. Made these tonight as they are similar to a previous oven recipe I had. The ribs were so good and tasty. Very happy with your website and all the recipes I have made so far. I recommend your site to my friends. These were amazing and super tender. We will probably add more vegetables next time but other than that they were perfect! No leftovers says it all! We are suddenly on a low salt diet, post hospital stay. Can you give some suggestions to replace the sodium content- substitutions for the soy sauce and fish sauce? In most recipes I have been using extra herbs for seasoning and making sure I have a nice font, but not sure how to compensate here. Thanks for you help. Purchasing the short ribs today, can’t wait to try out the recipe. Adding some mushrooms and a bit more seasoning will work. Wishing you good health & a speedy recovery. I have tried many of your recipes and they are always a hit with both myself and my husband. The recipes are simple and easy to follow. 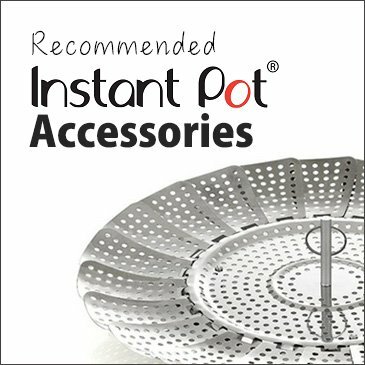 I have ordered an accessory kit that comes with a steamer – can I use this for the potatoes instead of a stainless steel bowl? 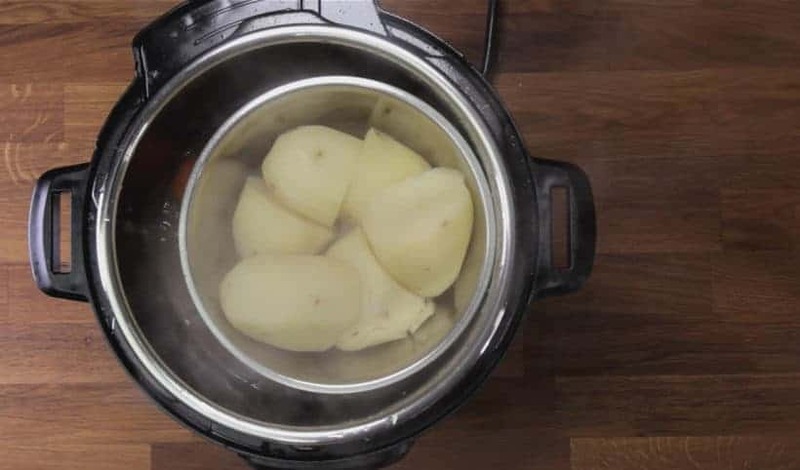 The potatoes will come out softer with a steamer as the steam will come in direct contact with the potatoes. hi guys, just wondering where you buy your short ribs (I believe you live in the lower mainland?). looks delicious and I can’t wait to try it! Thank you for your question. Larger supermarket usually have short ribs in stock so we purchase ours from them. What is the best way to reheat this dish after cooking it a day in advance? I have made this recipe a few time — best short ribs ever! Any tips for making these ahead? Can I reheat in IP? Would you suggest waiting to thicken sauce until reheated and ready to serve? I’ll be making about 30 ribs for a party – thanks! Reheating will make the short ribs slightly drier. You can heat it up in the IP with the sauce thicken using the Saute less function. Great recipe; will definitely be making this again. This recipe was excellent and we will definitly make these short ribs again. Our kids also loved it. Thanks for posting this recipe. DELICIOUS…made this tonight and my husband ranted and raved about how fantastic it was…with no leftovers. A definite keeper in my recipe box. Thanks so much for sharing and the very detailed step-by-step instructions. Since the meat has to be cooked for a long time , don’t the veggies turn too mushy? Or do we take advantage of this to thicken the sauce? Looking forward to making this recipe. Thank you! Yes, the carrots and celery will be quite mushy. They enhance the sauce with some sweetness and flavor (and some thickening effect). JUst made this recipe and boy wasn’t it a 🌟. My husband ❤️ it. Can’t wait to Make his at my next dinner party! SO impressive yet so so easy. Fall off the bone delicious! Made the recipe without potatoes. I served the ribs with egg noodles. I did not have fish sauce handy so I substituted Hoisin Sauce. I am a new Instant Pot user and really appreciated your step by step instructions. Photos were a bonus as I progressed thru the recipe. This will be a family favorite. Thank you so much for your kind words Marion! Silly question. When you say brown each side 4 min do you literally mean all 4 sides of the ribs? I really can’t tell. Browning the top and the bottom (2 sides) will work great. LOVE this recipe! Just delicious! Was planning on making it again tonight. However, my grocery delivery included Flanken (thin) cut short ribs, not the usual thicker cut. I am determined to make these work and am hoping you might have some suggestions. I realize this will be an experiment and will be delighted to report the results. I was thinking perhaps skipping the browning, or heavily brown one piece to get the fond? I also guess to shorten the cooking time. With a shortened time could I still make the potatoes if I cut them smaller? thank you so much for your kind words and sorry for the late reply. I am thinking 12 minutes and natural release will be enough for Flanken style short ribs. You can still make the potatoes, but they will have to be a lot smaller. I need to double the amount of short ribs. What adjustments need to be made to cooking and pressure release times. Also I want plenty of gravy to serve with mashed potatoes. Do I also double the sauce ingredients? Thanks very much. You don’t have to increase the cooking time for this recipe. I recommend reducing the cooking time by 1 – 2 minutes as the get up to pressure time will be longer with more short ribs. You will want to 1.25x the sauce ingredients and spices. Please adjust the seasoning at the end accordingly. My family loved this recipe and it will definitely be something I make again. I was wondering if you had advice on making the ribs less fatty at the end though? I bought what looked like normal short ribs, didn’t see a fat cap on them. But what was cooked was quite greasy tasting. I suppose a lot of the fat wasn’t rendered off. Any suggestions for my next trial? Thanks again for a lovely recipe. Running the gravy thru a fat separator will remove the fat. Made this last night (my first time using my IP). Followed the recipe exactly, and it was amazing! I can’t wait to try more of your recipes. Thank you so much for using this recipe as your first meal in the IP! How would you adjust for four 1”X9” boneless simmering short rib strips? Total weight 1.2 kg. I also plan on making with sweet potatoes. Making for dinner tonight. Thank you! I made this as stated a few nights ago (sub stock for wine) and it was delicious! Those should cook super fast. I will try 28 minute and natural release. Please take care & have a great dinner tonight! I don’t have corn starch… Could I use potato starch, or flour, or flour and butter as a thickener? What do you think would be best?? Love your recipes! And really appreciate that you always reply to questions. You guys are the best!! Potato starch and flour will work fine. For this dish, I will choose flour. I know we’ve never met, but I think I may love you guys. This was such a great recipe. I’ve never attempted braised short ribs. I read other recipes and people complained about the meat being tough or the sauce taking over 30 minutes to thicken. So glad I tried yours. It was perfect. You guys made me look good. Thanks for the care and time you take working out all logistics. I’ll definitely be trying some of your other recipes. Happy to hear how it turned out!! I plan to make these. They look great. Should I have my butcher cut the ribs in the “flanken” style ribs. We love this recipe and have cooked it a few times. It occurred to me that this could be used for a well marbled pot roast. The flavors are exceptional and would like the same for a pot roast. The flavor will work with a well marbled chuck roast! Made this today for my parents and I. One of my first attempts with the instant pot! No short ribs at my store, so I ended up using beef chuck. Turned out great, even though it wasn’t ribs. Loved the flavor!! Happy to hear your first attempt is a success! I never have wine when I need it, can I just use extra beef broth? Or would it be lacking flavor? It will change the flavor profile very slightly. You can use beef broth to deglaze. Short ribs are an amazing ingredient. Simply wonderful when done right – miserable to eat when done wrong. I’ve tried several recipes over the years, but now I’ll stop looking. My entire incredibly picky family all liked it and asked that I make sure to save it and ‘put it in the rotation’. Happy to hear your family enjoyed this one! How would you adjust the cooking time for frozen short ribs? I recommend increasing the cooking time by 1 – 2 minutes. I made this last night, substituting Guinness Extra Stout for the red wine because that’s what I had. Delicious! 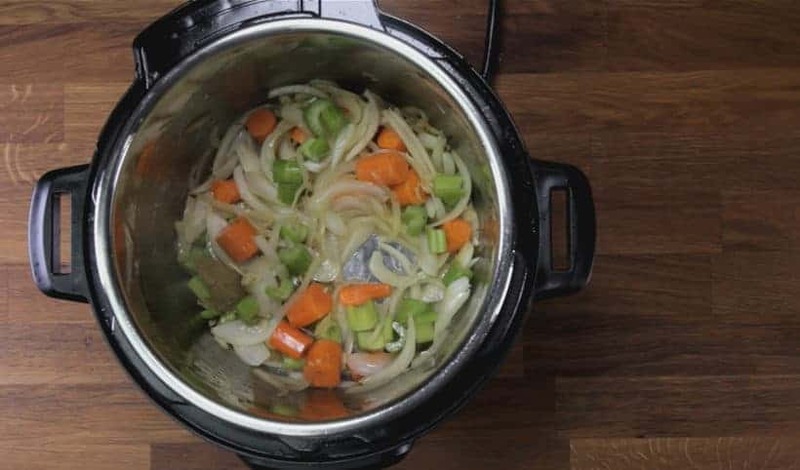 Hi Amy & Jack this recipe looks fabulous – as I can get great quality beef stock is that a better choice than chicken stock ? It will depend on your personal preference. Using beef stock will make this richer. I would like to make this recipe tomorrow but the short ribs that I was able to get are huge.. 4 ribs = 3.5 lbs. Would I cook them for the same amount of time and the same way? I am usually not a meat eater and have not made short ribs before…this is a special dinner for my grandson! Pressure cooking time is mostly dependent on the meat thickness. I am not sure how thick is your short ribs, but I will say 48 minutes and 15 minutes natural release will be enough. Hi Amy and Jacky, I’m here again! 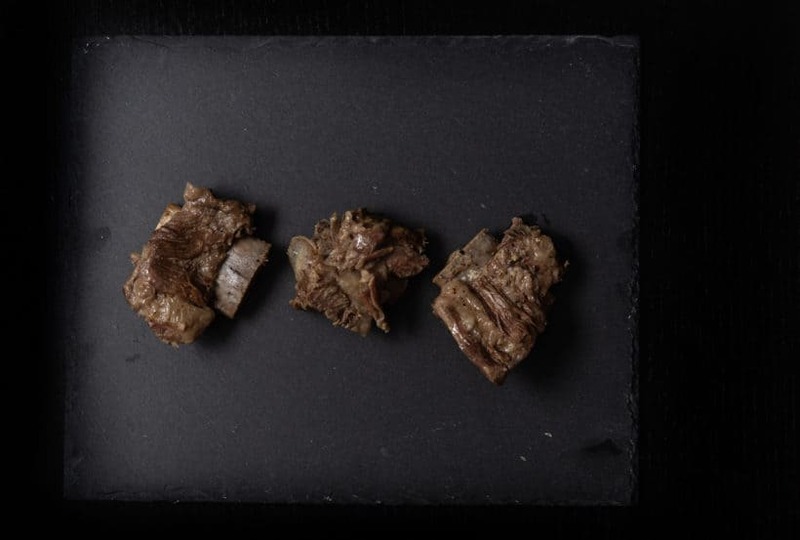 If I’m using boneless short ribs 2×2 in cubes, how long should I put them under pressure? Thanks! I recommend using 38 minutes and 15 minutes natural release. Thanks for replying so promptly! Just to add, in the middle of the sautéing, I just realized I did not have balsamic vinegar! I was freaking out and searching deep in my pantry. I found 镇江香醋! I gave it a try and the end result was awesome!!! I’ve been making these beef short ribs for several years and they never fail to amaze me. They are rich, fall-off-the-bone tender without being dry. Thank you both for all the time you invest to bring us “tried & true” recipes. 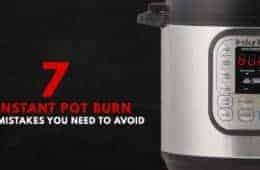 Whenever a friend asks me for a recipe for the Instant Pot I always refer them to this Web site. So happy to hear from you again 🙂 Hope you have been doing well this year. Thank you so much for your support & rave review on this recipe. We will keep on working hard! 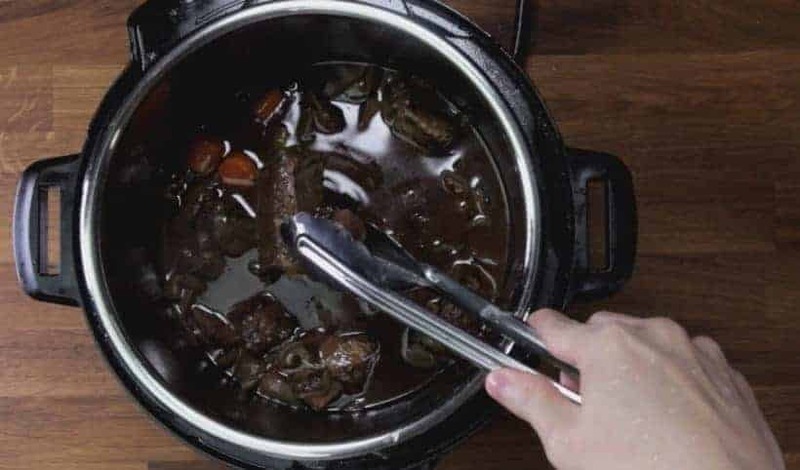 Glad you enjoyed the short ribs in Instant Pot! Thanks for sharing all these yummy recipes. I love your blogs especially the super detailed cooking instructions. Really appreciate you take the time to explain the cooking process. If I am using beef chuck roast, how long should I pressure cook it for? Can I substitute Balsamic vinegar with apple cider vinegar? Thanks! For a 2″ thick chuck roast, the cooking time for this will work perfect. Apple cider vinegar is quite mild and will not be an ideal substitution for Balsamic vinegar. I made this on this past Sunday, 10/21/18 and man did my husband devour this. He absolutely loved it. Even my 5 year old grandson, he only eats cereal, warm rice (his words) and cheeseburgers. He scraped the bowl!! Happy to hear your husband and grandson enjoyed this one as well! These are the absolute best short ribs I have ever had! I followed the recipe except for fish sauce. They were delicious! Made this recipe tonight for the inaugural instant pot venture! Was absolutely fantastic! Easy, and restaurant quality balance of flavors! Going into the saved recipes! I’m sure there’ll be lots more yummy instant pot meals coming! Thank you for this fabulous recipe! If I were to use boneless short ribs (about 12 strips – 7 inches long x 1 inch wide and 1 inch high), would I have to double all the ingredients? Does the sauce have to cover the meat fully? I have done a smaller amount about 6 strips of boneless short ribs on high pressure for 33 minutes. It was almost “fork tender” but not quite there. Would I need to increase the time cooked to get to “fork tender” – especially with almost double the meat? I’m still learning so hopefully the answers shouldn’t be obvious. Thanks for your help! The sauce doesn’t have to cover the meat fully. Just partially is fine. I would recommend increasing the spice and the seasoning by roughly 25% and keep the rest of the liquid ingredients the same. About 38 minutes will be about right. Looking forward to trying this short rib recipe tonight!!! We found 3/4″ thick flanken ribs & wondering if you would reduce the cook time? THANK YOU A & J!!! I would try reducing it to 36 – 38 minutes + 15 minutes natural release. I made this for dinner tonight and it was awesome! Loved the gravy, it will be my go to recipe for short ribs. Thank you for posting it! I am looking forward to preparing the short ribs for tonight’s meal. I have all the ingredients set out and realize that I do not have soy sauce. Can I use a teriyaki sauce or BarBQ sauce as a substitute? Maybe no substitute? What would you recommend? I would recommend just substituting the soy sauce with salt instead. I made this recipe last weekend and the ribs were moist, tender, anddelicious. The broth was almost too rich. I wasn’t able to make the potatoes pot in pot, because my short ribs were rather large and I had to stack one of them on top of the others. No worries, though, I just tossed them into my 3 quart Mini. I’d definitely make these again for company, but man oh man are short ribs ever expensive. Would I adjust the cooking time or pressure release for 12 ribs? Can’t wait to make this, thanks! Since the get up to pressure time will be longer, I would recommend reducing the cooking time by 2 minutes. I just finished eating this fabulous dish. The flavors were amazing and the meat extra tender. Thank you for yet another recipe that I will make again! You two rock!!!! Is there a way to adjust this recipe for frozen short ribs? For those nights I forget to plan and thaw dinner? Thanks! 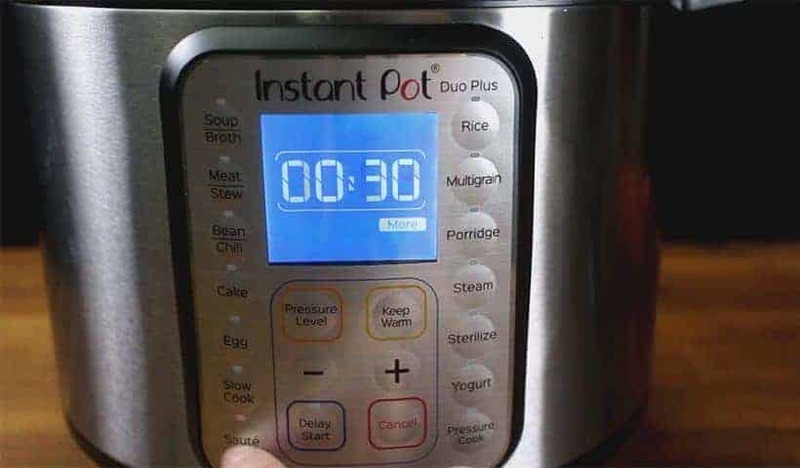 I would increase the cooking time by 1 – 2 minutes. I have made several of your Instant Pot recipes and all turn out to be fabulous. I have never sent you an email or thanked you for your the time and effort you are willing to put in so that I can simply pull up one of your recipes and know that it will be wonderful. You are truly a “go to…guaranteed to be delicious” site. I have enjoyed your risotto and the #17 cheesecake. I have made hundreds of cheesecakes from my favorite little “no fail” cookbook. Your Instant Pot version is special; so moist and creamy. My kids commented on that, as they have been recipients of most of my other baked cheesecakes. I look forward to trying as many of your recipes as possible. Thank you for what you do; nice to read that you are enjoying it! Your love and support means a lot to us. Thank you! Would this work as a way to cook regular (full size) ribs or is there a substantial difference between “short ribs” and regular size ribs? So happy to hear from you again 🙂 Hope you are enjoying the summer weather. Short ribs comes from the short plate, but beef back ribs should also work fine with this recipe. Made Pot Short Rib recipe today, took a bit of time but well worth the effort, turned out delicious. Our company was very impressed, made without any recipe changes. Appreciate your time and thorough recipes,Thank You. Hi Amy & Jacky! This short rib recipe looks so easy! Do I add any water in the bowl with the potatoes? Thanks for all the great IP stuff! No liquid in the bowl of potatoes. I held my breath and assumed your directions were right! And voila! Delicious potatoes that were perfectly cooked! There was a bit of wine taste in the mashed potatoes, but they were great and the short ribs were fall off the bone tender! I’ll never doubt you again! Beef chuck roast is probably the best substitution. All I can say is WOW! Just made the short ribs and they were amazing! The gravy is the best I’ve ever tasted. 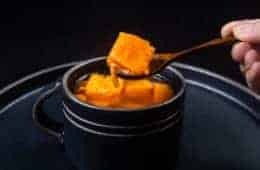 I am an IP newbie and before using this awesome appliance, I never had much confidence in the kitchen and I certainly would have never endeavored to take on a meal like this using the old fashioned method! The flavor was outstanding and the whole thing went together very quickly. Your step by step, very thorough instructions and pictures ensured a perfect outcome and I even cooked the potatoes in the IP at the same time. They came out perfect! Cleanup before and after was a breeze as well. Thanks very much for your tireless research and testing to come up with these recipes. Looking forward to trying many more! 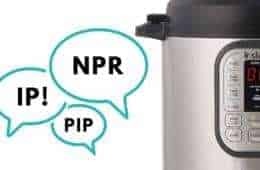 Congrats to your new Instant Pot! Thank you so much for using our recipe and your kind words. This looks great! Just st wondering why the cooking time with potatoes is longer than no potatos? The get up to pressure time will be longer with potatoes so the cooking time should be shorten a little. I noticed the recipe picture showed whole carrots but the instructions said cut up carrots. Can you adjust the recipe for whole carrots? Can’t wait to make this!! The whole carrots were roasted separately in the picture. The carrots in the recipe acts as flavor enhance and will be blended into the sauce (add sweetness) after pressure cooking. I love short ribs and these look fabulous. My aunt taught me to make mashed potatoes using fresh, whole cream, milk & butter from their milk cow. I’m afraid I am spoiled and can’t see myself using a different recipe even if yours does sound good and a lot less calorie laden. I always say I like a little potato with my cream and butter. I have spent that last 2 evenings peeling, seeding and freezing a bushel of roasted Hatch chiles. I do this every year to restock my freezer. So, we have been eating a lot of foods with them. Tonight, I was so tired from standing that I grabbed the eggs, cheese, milk and diced a couple of the peppers and made scrambled egg sandwiches with all the items. I’ll finish tomorrow by removing the frozen, diced ones from my muffin pans and vacumn sealing them. So easy to grab a bag with 1/2 cup diced, fresh peppers for cooking. If you have never tried roasted, peeled Hatch chiles from New Mexico, I hope you get a chance to while they are in season. It only lasts thru August if we are lucky. Not at home, but we have tried roasted Hatch chiles in restaurants! OMG… I just made the short ribs and mashed potatoes, last night, and they were incredible! Fall off the bone moist and that amazing flavor from the gravy! I’m drooling again just thinking about it. From start to table it took about 2 hours, but it was definitely worth it. I’ll be making this again. How would you adjust the time if using boneless short ribs? It will depend on the thickness. I would say about 3 – 4 minutes less. Your white rice recipe is my go to. I was hoping I’d be able to make these ribs with pip rice. Any thoughts on that? Thanks! White rice will become a bit soft with this cooking time. This and the other recipes look great. I’m looking forward to trying them soon. Great recipe – can’t wait to try it! Since you mention Chelsea Market, did you try the Whole Roasted Cauliflower at Miznon? 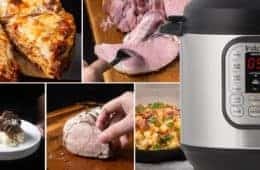 I would love to see you do an Instant Pot version of that item! We will try it next time!